First, we’ll start off with a bit of good news—if you haven’t scheduled your heating maintenance appointment yet, it’s not too late. Sure, we recommend it in the fall, typically. The reason for this is that it gives you plenty of time to get ahold of a service technician and reduces the risk of an interruption in service. Ensuring that you have your heater maintained at least once a year (twice, if you have a heat pump system) will help it perform at its best, and is more important than what time of the year you have it done. But you should have it done. The truth is, the biggest and usually the most expensive heating repairs in Westwood, NJ can almost always be prevented with routine tune-ups. It’s during these tune-ups that our pros are able to comprehensively inspect and clean your heating system, make necessary adjustments, and recommend repair needs as we go so that you have plenty of time to get them on your schedule before you need your heater. 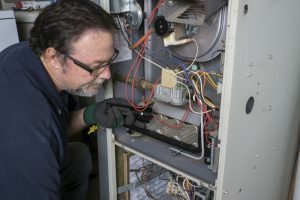 Skipping or delaying maintenance can lead to a number of heating issues, with two of the most common being a heater that won’t start up, and conversely, a heater that won’t stop running. There are a few possibilities to choose from, here. Some issues are more serious than others, but pretty much any of these can be caught beforehand, with maintenance. One possibility is that you don’t have a problem with your heating system at all, but rather with your thermostat. Be sure to check that thermostat to see that it is actually in heating mode, first. If it is, but your system still won’t start up, then turn the power off to the thermostat from the circuit breaker, and then check for frayed wiring. Don’t skip shutting down the circuit breaker first—this is for your safety! Let’s say this isn’t the issue, is a lack of electrical power to blame? When you checked that circuit breaker, was it tripped? Or perhaps there is a power outage in your neighborhood. Even gas powered heaters rely on an electric ignition, so this is an important thing to check on before calling in a technician. What if none of the above-mentioned scenarios matches yours? Well, you might have a more serious operational issue on your hands. Your next move should be to call in a professional. Perhaps you ignored this symptom at first. “Maybe it’s just that cold in my house,” you might have thought. While a heater that won’t stop running may seem like a minor problem, it unfortunately is detrimental to the efficiency of your heating system and it could actually be slowly damaging it. Plus, do you really want to be that warm inside your home? Again, this can also be due to thermostat problems and not an issue with your actual heating system at all. If the thermostat is miscalibrated, in the wrong mode, or malfunctioning in some other way, then it may not be able to accurately signal to the furnace that your desired temperature is being met, and it’s time to shut off as a result. It’s also possible you have your thermostat set too high, and your heater is struggling to meet your desired temperature. DB Heating & Cooling, Inc serves the heating and cooling needs of customers throughout Rockland County, NY as well as Bergen County, NJ and surrounding communities. You can count on us for expert services. Contact us today! Help! Why Is the Air Coming from My Furnace Cold?